So, went to Disney World for a week with the fam. Scott Van Pelt got behind me in line at one point, so I got to meet him. That was kind of cool. P.S. He's tall as @#$^! Players got arrested, run em till they puke and move on. Auburn lost, the people celebrate. Anything else of note? DW is fun, but you don't get a lot of R&R there. Glad to be back. What days did you spend at DW ? The days? Was there Sun to Thur. Sat and Fri were travel days. I was there all last week. Never seen it that crowded but my wife is a Disney pro so no waiting to do anything. I am a Disney World Junkie. Not necessarily a fan of the mouse or the movies, but I love WDW. 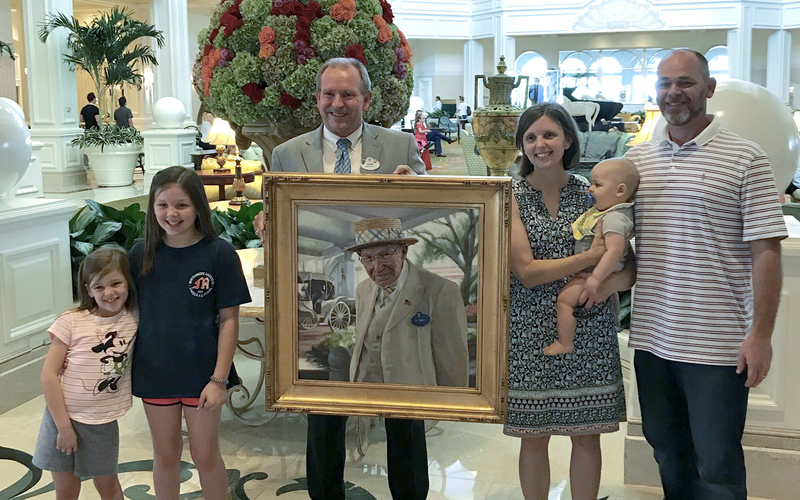 I was fortunate to have done some artwork for them last year and my family was (unexpectedly) treated like royalty for a week when I delivered (in person, of course. Not typical protocol unless it's the happiest place on earth). It was my first trip ever. And honestly got to say it exceeded my expectations. It's not cheap, but you get what you pay for. I appreciate a job well done, and those folks do a fine job down there. Is there someplace we can see what you did @JoelSidneyKelly ? It’s all in the planning. Have a schedule and take advantage of the fast pass system. Like I said my wife needs to work for DW, she’s got it down to a science. 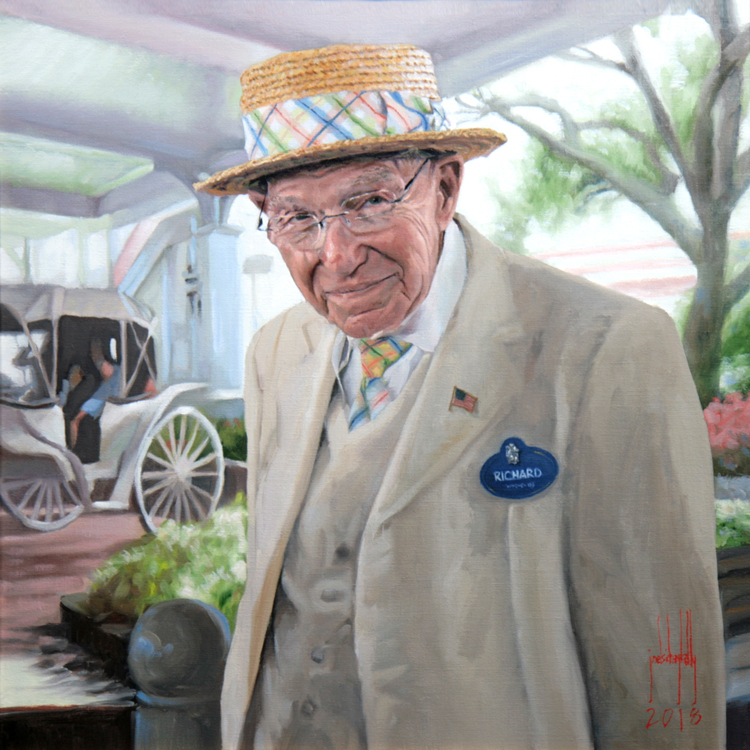 It is hanging in the Conference Center (named after the man in the portrait) at the Grand Floridian. Dude, that is awesome ! That’s so cool, thank you for sharing! I love going to DW but most of my time is spent at Epcot (mildly inebriated so that probably doesn’t help) so I didn’t recognize him. However, my wife did the college program and she recognized him immediately. Did you get to stay at the Grand Floridian when you went? That's fantastic! We ate dinner in there one night. That hotel lobby is unreal. It's got to be one of the classiest places they have down there. I will definitely show my wife this post later. Glad to know my portrait resembles him! He was a wonderful man and a Disney rock-star. We did stay at the Grand. With a theme park view. And got fifteen walk-on fast passes. I will be honest.... I don’t look forward to the day I have to to take the family there. I know it’s coming. Just don’t like parks that have crowds. Or crowds in general. People touching me and always being on alert... wears a bro out. It’s a crazy world. However, I have to say @JoelSidneyKelly bro that is really cool! Awesome picture and y’all should have been treated like royalty. I’m sure it took a minute to create. @JoelSidneyKelly I knew you were talented by what you usually post here but WOW. That is amazing. I don't know the first thing about art but I love to see it in just about any form. You need to have a show so I can go and enjoy it. If it makes you feel better, I felt almost exactly the same way before we went. But I had a great time in spite of it. Ditto on that. I dont like crowds either. It ended up not being anything like I thought. Took advantage of the fast pass or what ever it was called a few times. Took wife down back in mid Jan, that’s the perfect time. Cool temps, crowds not so bad. Last week was to celebrate my daughters 5th bday, big crowd and cranky kid makes for long days but well worth it. We’re big fans of late-September, the weather is good and the crowds aren’t insane and there’s the Food & Wine Festival going on at Epcot. If you’ve never done F&W and you like DW then it’s a must do someday. It’s not cheap (what at Disney is?) but with the right people it’s a great time consuming a bunch of different food and alcohol. Late Sept or early Nov for us. Lowest crowds. I'm worried about what's going to happen with crowds when Star Wars opens. Studios will be nuts, more time in the other parks. @JoelSidneyKelly none of that surprises me in the least! It’s fun to imagine you running around WDW like a kid! My husband and I went there for our honeymoon, which might seem weird. But it’s even better as an adult. We literally spent our whole honeymoon eating and drinking ourselves into oblivion. It was amazing! Perhaps there should be a Walt Disney World Travel topic in Off Topic category? Recall being in an IHOP one Saturday, late 1960s, in the ATL area seeing a guy with blueprints of something called Buena Vista (something - may have been Lake Buena Vista something). This was before WDW opened and most did not know what was planned (it had been announced per Wikipedia). So, tells me that some ATL firms were very involved with the project. Recall seeing an odd looking guy on a flight down to Orlando. Turns out he was a street performer at WDW. He was on the return flight, so he might not have worked out. Stayed at the Dolphin soon after it opened. In spite of being a non-Disney hotel, a Disney character or two appeared at breakfast some mornings. Also saw a family - Japanese - with a "Japanese Breakfast" - some sort of rice porridge along with fruit and ?. Never saw the fascination with EPCOT. Liked the restaurants, but must have missed the real attractions there. Tomorrowland was well out of date even in the 1990s. For what it's worth, I tried to change the subject title to reflect the DW discussion since that's what the thread evolved into. But I couldn't figure out how. Changed it and if you want anything different, just let me know. It’s obviously not my thread so I’ll defer to @RxDawg but thank you for the help!